I saw the idea for the "This Much" card on Pinterest and knew it would be perfect for the grandmothers. Which is why I didn't post this before Valentine's Day since both grandmothers visit here regularly and I didn't want to ruin the surprise. Both of them loved it! Each card has a Will hand and a Joseph hand. 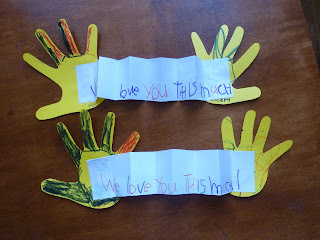 The boys decorated their own hand tracings and then I glued it together. On the paper that stretches out, Will wrote "We love you this much!" Easy craft with big results. I highly recommend it for next year.